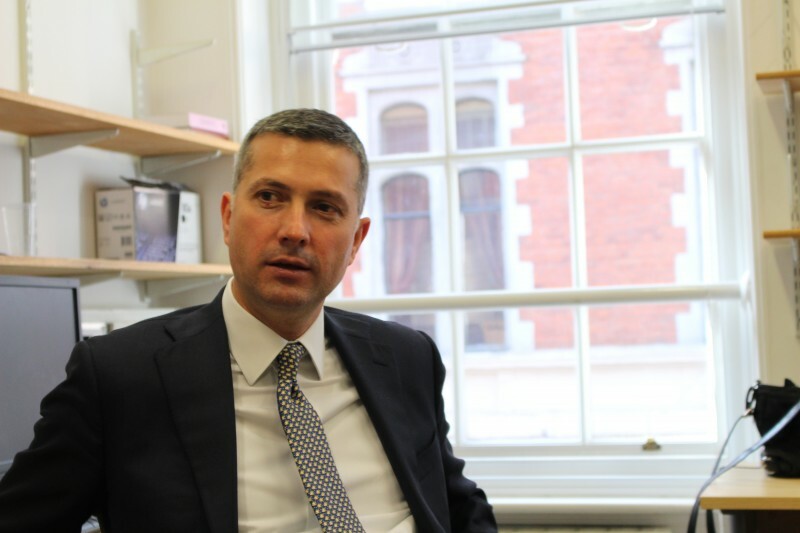 Kosovo’s Minister of European Integration Bekim Collaku talks to LSEE’s Tena Prelec about the country’s recognition status, challenges and successes in EU integration, and economic vows. What about Serbia? “The Serbian leadership should be more European in their attitude toward Kosovo”, he says, “We would like them to stop creating problems for Kosovo through their illegal parallel institutions”. According to Frontex, people from Kosovo accounted for 40 per cent of all illegal entries into the Schengen zone in December of last year. How do you explain this? Do the large numbers of people leaving indicate that Kosovo is failing in its efforts at EU integration? The increasing number of people leaving Kosovo is not an indication that we are failing at EU integration. The increase in those leaving Kosovo is not only for social-economic reasons: in fact the living standards in Kosovo and the salaries available are in most cases better than in neighbouring countries. Kosovo is not in a difficult position in this respect. However, we have indeed experienced an increase and it is tragic to see as there have been cases of people suffering as a result. We have taken swift measures to explain to our population that emigration is not a solution for their problems. We have adopted a new government programme that is mainly focused on the economy and will provide results in the future. We are now coordinating all of these efforts with EU member states to help bring our citizens back to Kosovo. As a temporary measure we are also negotiating temporary working agreements with some of the EU states that would be ready to accept some of our skilled workers. We have had some initial discussions with Germany and we expect to arrive at something concrete in the near future. Five EU countries – Spain, Slovakia, Cyprus, Greece and Romania – have still not recognised Kosovo as an independent state. What are you doing to improve relations with these countries? It is unfortunate thatthese five countries still don’t recognise us. This has created problems for Kosovo in our path toward EU integration and membership. But as a result of the efforts we and the EU institutions have made during this process, we have nevertheless been able to move Kosovo’s agenda forward. Each time that we’ve had to deal with these countries we have always found the political will to address their concerns and this has allowed us to make progress without any of the five using their veto power to block the process. Of course, we are hopeful that this situation will change in the future. We expect that these countries will come to the conclusion that Kosovo is capable of functioning as a proper democratic country. We expect them to be pragmatic and eventually reach a stage at which they recognise our statehood. Our progress toward recognition and EU membership will not only help Kosovo, but will also improve the stability of the region. It is vital that we make sure all countries can become members of the EU once they fulfil all of the relevant criteria. Any speculation on which of these countries is going to recognise Kosovo first? We have relations with most of these countries, particularly Greece, Slovakia and Romania, as well as looser relations with Spain and Cyprus. I wouldn’t be surprised if we received some positive news from Greece and Romania in the near future, potentially even this year. Which countries have been the most helpful in the EU accession process? Kosovo has absorbed around 1 billion euros since we became independent. We are part of the EU scheme which provides pre-accession support to all Western Balkan countries and this makes EU the biggest contributor. In terms of individual contributions, Germany, USA, Switzerland have been the main contributors, followed by many other countries like UK, France Italy etc. Is there a danger that if the UK leaves the EU it could affect your progress, given the country has been a strong supporter of Kosovo’s statehood? It is not up to us to tell British politicians what is best for their country. However in our view the UK has played a very constructive role within the EU’s institutions in addressing the previous crisis in the region and later in helping all of these countries with reconstruction efforts. My personal preference would be for the UK to stay in the EU as an important player. That would make us more confident about our progress. You have been involved in the dialogue between Kosovo and Serbia since the beginning. What were your relations with your Serbian counterparts? The main condition for dialogue to take place was not to have any conditions. So the dialogue was unconditional and essentially had the aim of bringing the two sides together around the table, allowing both to discuss their own issues until a solution could be found. This was one of the reasons why the transparency of the talks was limited as we could not reveal to the public every element of the lengthy conversations that took place. But regardless of this, I think the techniques that were introduced during this process were different. They very often made each side believe that there wasn’t enough commitment being shown by the mediator because solutions were not imposed. Instead they emerged from agreement between both sides. It took a lot of time and effort, but in the end it proved to be successful because the first agreement to normalise relations between the two countries was a genuinely historic achievement. It was the first agreement between Kosovo and Serbia after a century of conflict and war. It gives an indication of how far each country has moved in normalising relations and this has been possible not only because of the political will shown by the countries themselves, but also because of the bigger picture and the bigger goal that is EU integration for both Kosovo and Serbia. What is your opinion of Serbia’s current political leaders? They seem to be pro-European and this is the most important thing for us. We expect them to be more European in their attitude toward Kosovo as well. We would like them to stop creating problems for Kosovo through their illegal parallel institutions and their finances and we hope that the more European they become, the more they will use these pro-European attitudes to help both sides move forward in the process of EU integration, without placing obstacles in our path. One story which has made some headlines recently is the construction of the highway between Kosovo and Albania, which some observers have criticised as a waste of resources. Kosovo had a desperate need to improve its own infrastructure and a highway was more than necessary – not only because it allows for a larger flow of people and goods, but also because it is a sign that Kosovo is improving and thereby creating a better environment for investment. Whydid you decide on this highway project instead of improving links with Serbia and Macedonia where the trade is higher? Building the highway between Kosovo and Albania was completely normal because it addresses the needs of citizens. Most people from Kosovo spend their vacations in Albania and the existing road was inadequate. Albania built its own highway to the border and it was up to us to do our own part.However we are also building a highway that will connect Pristina to Skopje. We will also build an extension of the highway that will connect Kosovo to Serbia. We expect this project to be funded with money from the European Commission. It has already been presented at the Berlin summit held by Angela Merkel last summer. We also have the ministers of six countries in the region meeting and discussing these infrastructure projects, which will be joint-projects between ourselves. The next summit, which will be a continuation of the one in Berlin, will take place in Vienna this summer and we expect to see some concrete projects approved and supported financially. Nevertheless there have been estimates that in 2010, at the time when the bids to construct the highway were made, the total cost amounted to 27 per cent of Kosovo’s GDP. Was this money well spent? These are costly projects and a country like ours has to make tough decisions. We couldn’t wait forever, hoping to benefit from European Commission funding to finish projects on this scale. Regardless of how limited our budget is, we had to prioritise and the priority was given to infrastructure. Was this money well spent? Absolutely. In each of the bidding processes the government hired transaction advisers from well-known international legal firms with substantial expertise. The processes have been fully transparent and the opening bids were done in front of the media. Like anywhere else in the world, the one who made the best offer won the tender. There are lengthy procedures where the contract and all the technical details are discussed. I can tell you that in both projects the winning consortiums came out with the best price both in the design and in the terms of the contracts. Corruption is oft quoted as one of the major challenges for Kosovo. Very often corruption is perceived as taking place in state-owned enterprises. The best way to deal with it is to privatise them. In this way you avoid the phenomenon of revolving doors between the government and the private sector. This doesn’t seem to be a panacea, as in many cases we have seen such companies coming back into public hands, only under different names. Isn’t this something to avoid? Absolutely, this should be avoided at all costs. Now we are living in a free economy market which is driven by hard competition, and states should notbe stronger in a race with a competitive private sector. There are certain assets that each government wants to keep, as in some cases it becomes an issue of national pride, but I think the endgame should be privatisation. But how do you keep the process safe and sound? By putting professional people in charge of these enterprises.We have experienced many problems in this sense so far. I will do whatever it takes to make sure that true professionals take the leading seat, and not people who have political or family connections.Kosovo has embraced the market-economy and we see the private sector as a solution. We are creating the necessary conditions, bringing the best legislation in order to empower the private sector which is the best tool to develop our economy. What drew you to politics and what are your future ambitions? You are currently a PhD student at the University of Gent. I initially didn’t want to become a politician, but an academic – and ended in politics more by chance. We will see what the future brings, but it is my wish to return to academia at a certain point. My PhD programme started before I took over the role of Minister for European Integration, and it is going slow in this period..
How close are your ties with former PM and current FM HashimThaci? I have known him for years, and over this time he has changed a lot in a positiveway. He has improved his skills as a leader and has been able to show leadership during all these years. I have high respect for everything he has done. For spearheading the fight for freedom during the war, but also after the war – for helping to build a nation and a state from scratch and to bring Kosovo among the free nations of the world. It has been a painful and lengthy process, it has often required painful decisions but this has been possible to a great extent thanks to his leadership as a statesman, but also thanks to the contribution of many others. This interview has been simultaneously posted on the LSE EUROPP Blog. Bekim Collaku has recently given a talk at LSEE, whose podcast can be accessed here. This entry was posted in Interviews, Kosovo and tagged Bekim Collaku, corruption, European Union, Kosovo, Serbia, state building, state recognition, Tena Prelec. Bookmark the permalink. I shouldn’t really comment on what Kosovo (or indeed any Balkan) politician are saying; it’s pointless to talk to them. If you just read his answers, they sem so pathetic, typical balkan politician. However, I should point on one aspect of what the minister says, quote ‘the increase in those leaving Kosovo is not only for social-economic reasons’. this is utter lie! I, and many – if not all people in Kosovo) know otherwise: they’re leaving because there’s no better chances in Kosovo. Quite simple! My view is that for as long as people like him and other politicians rule Kosovo ther will be no prosperity. No comment! Utter lie! Typical Balkan politican! On the highway, the minister says “In each of the bidding processes the government hired transaction advisers from well-known international legal firms with substantial expertise.” This is true. What the minister does not say, however, is that the government ignored its advisers’ advice. They said that the contract proposed by the consortium was “not compliant” with the tender rules and “extremely dangerous” (because “the apparent contract price [was] nothing more than a non-binding estimate”, liable to rise during construction through revisions, penalties and extra costs: which is exactly what happened); the government ignored this advice and signed the contract. This is quite extraordinary: at the time the government talked (wrongly) of economic integration, not of holidays. And while it may well be true that quite a few of those Kosovaars who go on holiday choose Albania; but they are a slim minority, in a country with such levels of poverty and unemployment, and such low average wages. I fear the minister is not well informed about the highway, or about the socioeconomic conditions of his country. It is quite striking thata number of foreigners who have lived in Kosovo (as you did) and the number of them outside again and again think that people like Collaku is not informed or he doesn’t know. I, as an Albanian, think that you and many others are wrong. The fact is that people like Collaku or Thaci or present PM know damn well what they’re doing and the pain and misdeeds they cause on the ordinery people. The only time they seem not to know is when they think that others think they they don’t know! These are a corrupt bunch of people that, to a large extent, have been nourished by the West. Period! I agree with you and disagree with my last line, which was meant to be ironic but evidently is not. Thank you for your posting anyway. I think that people like you (your article few years ago in ‘The Independent’ newspaper) and barely few others are indeed doing a favour to both, the EU and Kosovo as well for disposing of the wrongdoings (here used certainly as an eufemism for the word ‘scum’) in Kosovo. As for the last line..I should have got it…british sense of humour!